The singer looked triumphant as she removed her makeup and hair extensions. Demi Lovato just got a beautiful make-under! The singer, 25, went makeup-free in a dramatic video for Vogue as part of the magazine’s new series honoring strong and inspiring American women. 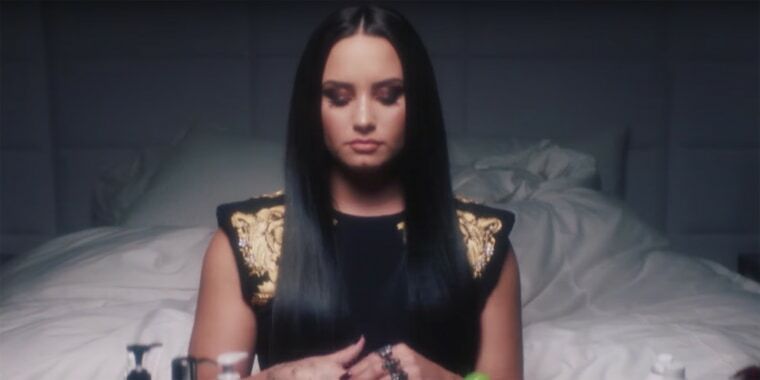 Lovato has always been very open about her personal struggles, including drug and alcohol addiction and an eating disorder, and her Vogue project is just the latest example of her raw honesty with fans. In the video, the pop star starts with a full face of glamorous makeup, then slowly but surely wipes it all away. The singer looks defiant as she peels off her false lashes and rubs off her lipstick and eye shadow, as ironic audio from vintage makeup tutorials plays in the background. She also cleanses her face, revealing her lovely freckles, and even removes her long, black hair extensions. “I think society tells us we need makeovers, but why can’t we embrace the beauty that we naturally have?” Lovato said in an interview with Vogue, which also posted the video on YouTube. The singer is by no means anti-makeup — her usual beauty routine for work involves two hours of primping, contouring and hairstyling — but she wants to remind fans that she doesn’t need makeup to feel beautiful. “I love makeup. I love doing my hair; I have extensions, but there’s a time and a place for everything, and natural beauty needs to be celebrated,” she said. Lovato has long been an icon for body positivity on Instagram, posting honest photos and messages about her own journey toward body confidence. She rebelled against restrictive beauty standards in another post celebrating her lack of a thigh gap. At the end of the Vogue video, a radiant, makeup-free Lovato smiles triumphantly into the camera. Judging by the video’s views so far — more than four million in less than a day — her fans feel same way about her latest transformation!